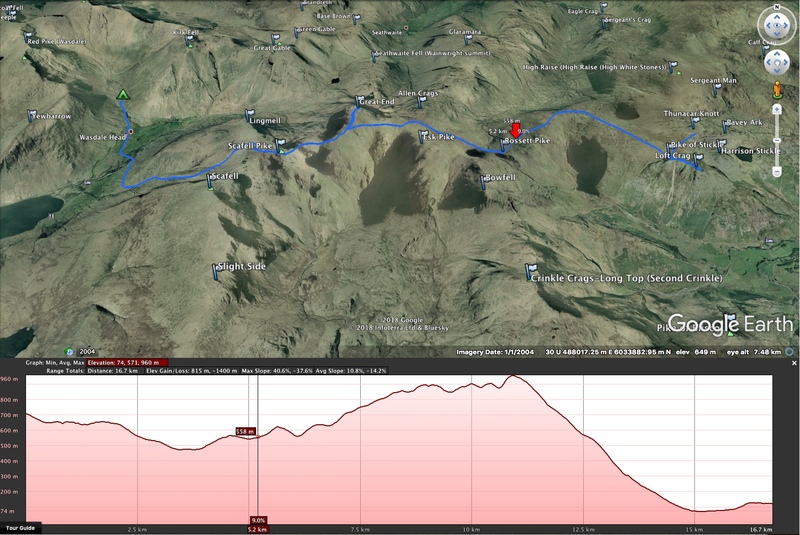 I’d been planning a trip to the Isle of Skye to do the Skye Trail with a friend of mine Dean Read, however plans changed due to various other commitments, so a shorter trip was arranged in The Lakes. Dean and I drove up on the Saturday morning to meet Peter Dixon (The Lake District Legend) near Elterwater. My friend Trevor made his way up later that evening to meet us at Camp 1. Peter had plans the next day so he walked with us for the afternoon and camped with us for the night before heading off the next morning. Driving up from Derby Dean and I arrived in Elterwater around midday and headed off to our first summit Silver How. 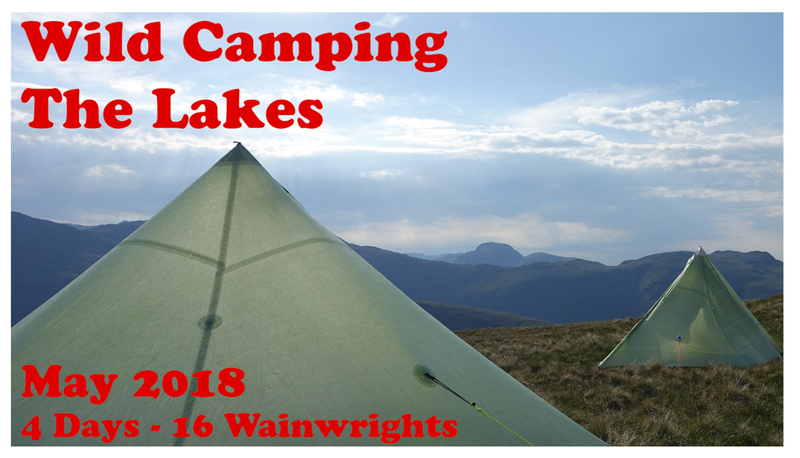 We met up with Peter along Blea Rigg where we ticked off 5 other Wainwrights together (Sergeant Man, High Rise, Thunacar Knott, Pavey Ark, Harrison Stickle, although Peter has completed all the Wainwrights several times over). We setup camp on Thunacar Knott just below the summit out of the wind. Later that evening I made my way over to Loft Crag where Trevor would walk up from the Hotel car part below. Sat eating my Chicken Tikka Summit to Eat meal I patiently waited for Trevors arrival. An hour later and still no sign of him, light was fading so I headed back to camp to dig out my head torch. On my way back, out of the dim horizon Trevor appeared! More luck than anything we just about bumped into each other, we walked up to camp to meet Peter and Dean. Trevor set about putting up his tent and getting some food on the go. A very still night and a great sunset! Up early to catch the sunrise (well everyone except me that is) we had breakfast and packed away to head for the next Wainwright Pike of Stickle. At Loft Crag Peter said his goodbyes and headed off. 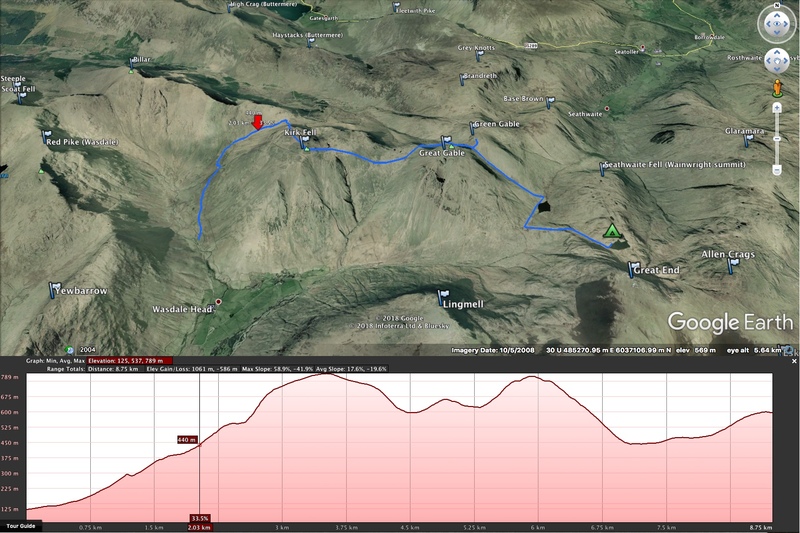 Trevor, Dean and I dropped down off Loft Crag and headed to Rossett Pike. It was already well into the mid twenties at only 10:00am, we stopped by a stream below Martcrag Moor to take on some water and to cool our hot feet. Arriving at Rossett Pike around lunchtime we headed over to Angle Tarn for some grub. 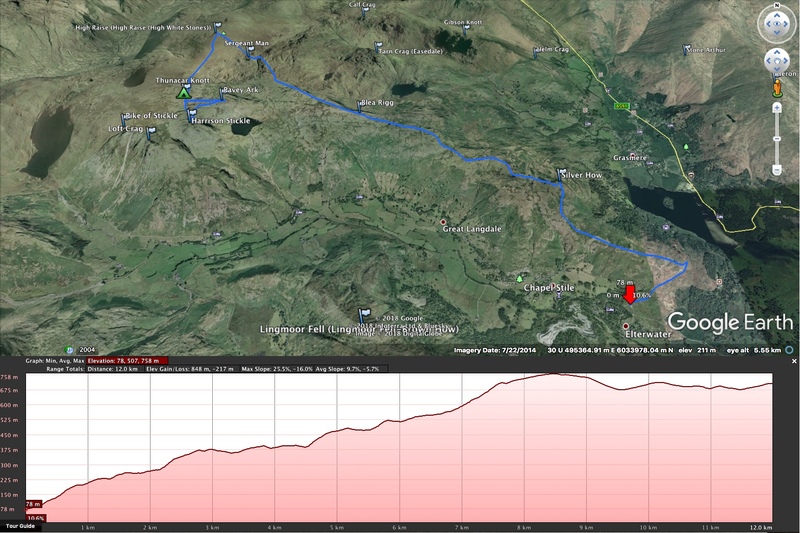 The steady climb out of Angle Tarn towards Great End was made more taxing given the Mediterranean temperatures. The path got steadily more busy as we approached the tourist hot spot of the Eastern flanks of Scafell Pike. Dean having already bagged a fair few of these summits opted to watch the packs while Trevor and I nipped up Great End to bag it. Having ticked it off the list we regrouped and headed over to Scarfell Pike before following the very busy path towards Lingmell Gill and around to Wasdale Head for a well earned pint. The small campsite was crowded so after some food and a few beers we headed back out onto the access land north into Mosedale. The three of us pitched our tents as light was fading, not a sole in sight, a far better location than the crowded, noisy campsite back in Wasdale! Another still night and bright warm morning, Dean was up early and had a swim. We sat by the stream Mosedale Beck (?) and had our breakfast before heading for Kirk Fell. The Black Sail Path winds slowly around the West side of Kirk Fell, reaching the Northern edge we followed the steep path at Kirk Fell Crags. Some recent land slippage as eroded the path, I’d not recommend this route. Instead look for a row of metal fence posts on the North West edge (southern side of the marked path). The route we took was a scree scramble involving some ballsy moves. Safely at the top of the crags we headed to the summit before dropping off the Eastern side towards Great Gable. The plan was to summit Great Gable however the heat and some tired legs amongst the group we opted to pass Great Gable via the lower North path to Windy Gap. Dean and Trevor took a break while I legged it up to Green Gable. 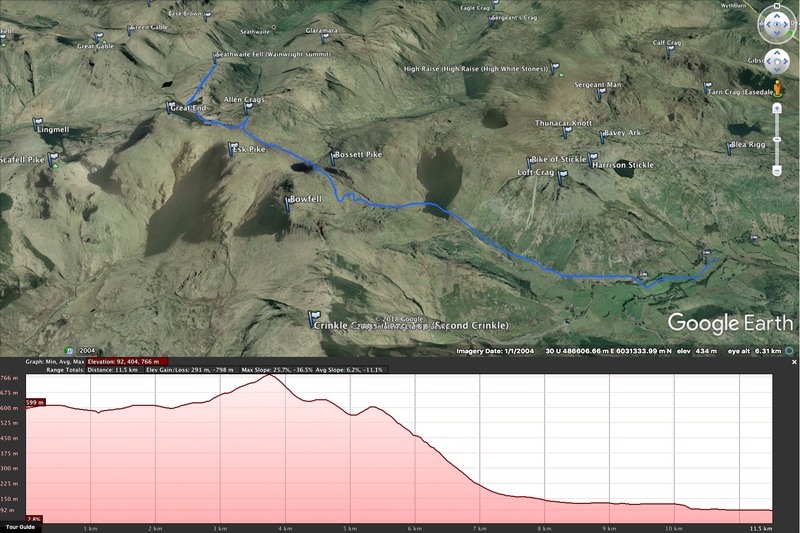 We descended via the Aaron Slack path (very nice icy cold water here) to Styhead Tarn. Arriving at Sprinkling Tarn we pitched up and relaxed watching other fellow campers arrive through the evening. By the time it was dark around 4-5 other tents were dotted around the tarn, nicely spaced out and considerate of others (probably too far from the nearest carpark for the disposable BBQ chavs). Our final day of the trip, yet another perfect night and sunny morning (that must be a record!). We’d discussed the idea of a swim in the tarn the evening before, not wanting to chicken out (Trevor!! ), Dean and I went for a dip. It was as Baltic as expected! 10mins was enough. Before heading South East back to the car we nipped over to Seathwaite Fell for our 15th Wainwright of the trip. Whilst heading back from Seathwaite Fell to Sprinkling Tarn we were treated to a RAF Hawk low level flyby, screaming past at about the same altitude as us and up over Great End. Heading for Angle Tarn once again, I bagged Allen Crags and caught up with others to join the Cumbria Way path back to Trevors car. Trevor had parked at the New Dungeon Ghyll Hotel, we had some lunch before Trevor drove Dean and I back to my car over at Elterwater. A perfect 4 day adventure with amazing weather and great company.